Paying for college is stressful, especially if you don’t know where to start. Fortunately for Hawaiian residents, a generous number of scholarships are offered by public and private Hawaiian organizations for residents and students with native Hawaiian ancestry. What’s more, you don’t need to attend college in Hawaii to qualify for all types of scholarships, either. The Office of Hawaiian Affairs (OHA) offers many scholarships for Hawaiian students, as well as resources to connect you with financial aid providers. Public and private organizations can also help you fund your tuition. What types of financial aid are you eligible for, and what steps do you need to take to apply? Let’s walk through the four steps all Hawaiian residents should take towards funding their college education. No matter where you live in the United States, your quest for financial aid begins the same way: with the FAFSA. The FAFSA stands for the Free Application for Federal Student Aid, and is the standard form used across the nation to determine students’ financial qualifications, and determine their eligibility for different types of aid. Few people reflect on the FAFSA as an enjoyable form to fill out, and we’ll agree, it’s a long form. Completing it is beneficial, however, as the FAFSA has the potential to connect you with scholarships and grants that could be crucial in funding your education. You will want to fill out the FAFSA as soon as possible, because many scholarships and grants have early deadlines that you will not want to miss. So, take a deep breath and get typing. If you experience any difficulty or frustration, check out our free guide to completing the FAFSA. As we mentioned above, the FAFSA will automatically evaluate you for some state-funded scholarships, but you may have to apply for some others by yourself. Most of Hawaii’s state grants can be used exclusively toward tuition at the University of Hawaii. However, as there are ten University of Hawaii campuses spread out across the islands, this gives residents a fair amount of options. The Second Century Scholarship for Native Hawaiian students demonstrating financial aid. State of Hawaii B Plus Scholarship for Hawaiian residents with financial need who graduated high school after 2005 with a 3.0 GPA or higher. Hawaii Student Incentive Grant (HSIG) is a federal grant that is matched with state and institutional funds. HSIG provides financial aid for Hawaii residents who are eligible for the federal Pell Grant and who are enrolled at an eligible Hawaiian state university. Hawaii State Need-Based Opportunity Grant for students with financial aid enrolled at least half time at an eligible Hawaii college or university. Additionally, University of Hawaii Manoa offers a tuition waiver for full-time undergraduate students with a 2.5 GPA or higher who demonstrate financial aid. OHA’s Native Hawaiian Science and Engineering Mentorship Program Scholarship (OHA-NHSEMP) provides scholarships to students of Hawaiian ancestry pursuing a STEM major. A good way to learn about financial aid resources that may not be offered by the state or federal government is to do meet with your high school guidance counselor. They can often connect you with local scholarship opportunities from businesses or community organizations. You should also do some online research on your own. You can visit the websites of additional public and private colleges and universities in the state, such as Hawaii Pacific University, to learn about specific financial aid resources available at other institutions. Residents should also look into offerings from private and nonprofit organizations. The Hawaii Community Foundation offers a range of scholarships for Hawaiian residents that can be used at schools in various territories of the United States, depending on the specific award description. The AFCEA Hawaii Educational Foundation (AHEF), which stands for the Armed Forces Communications and Electronics Association of Hawaii, is another nonprofit organization that offers merit-based scholarships in honor of Hawaiian leaders of the armed forces. If you’re currently in high school, you can also schedule an appointment with your high school guidance counselor to make sure you’re up-to-date on all of the latest opportunities. 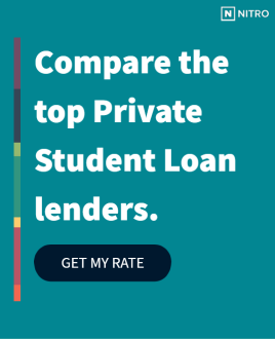 A private loan may be able to make up the difference you need in paying for your education if scholarships and grants aren’t enough. Not all loans are the same, so do some research before committing to the first option you see. Our free NitroScore tool can help predict the size of loan you will need, and help you figure out what your financial situation might be after college. The tool will ask you to plug in your intended college, major, and financial info into the designated boxes. It will then generate a score detailing how easy those loans will be to repay based on your projected post-college salary. Finances shouldn’t have to stand between you and a college education. Start planning for your future today.